By Jason Kim: Lou Dibella, the promoter for WBC Diamond middleweight champion Sergio Martinez (48-2-2, 27 KO’s), expects WBC middleweight champion Julio Cesar Chavez Jr. and his promoter Bob Arum to immediately start negotiations with them after Martinez first takes care of Matthew Macklin on March 17th at Madison Square Garden in New York. Dibella says he’s sick of waiting for Chavez Jr. to defend his World Boxing Council title against Martinez. If Chavez Jr. fails to fight Martinez next, then Dibella wants Chavez Jr. to vacate his WBC title so that Martinez claim it. Both Chavez Jr. and Martinez were allowed to have voluntary defenses against Marco Antonio Rubio and Macklin. 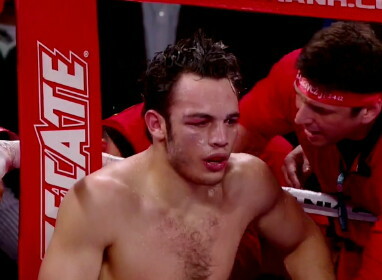 Chavez Jr. defeated Rubio by a 12 round unanimous decision. However, there is already talk that Chavez Jr’s promoter Bob Arum is looking to set up a fight between Chavez Jr. and Top Rank fighter Antonio Margarito next, who fights at junior middleweight, not middleweight. It’s unclear if the WBC will allow that to happen or not with Margarito unranked. However, you can imagine that if the fight does get made, Margarito will find himself ranked somewhere in the top 10 by the WBC in the middleweight division. Andy Lee, #6 WBC, is also a fighter that is being mentioned as a possible opponent for Chavez Jr’s next fight. He’s obviously a lot better choice because Lee can fight and is a legit middleweight. I think Dibella and Martinez could end up waiting a long time before the WBC takes any action to force Chavez Jr. to fight him. I think they’re not going to lift a finger to assist in this matter and if the does happen it will be when Arum and Chavez Jr. want it to happen. Who knows when that will be? Chavez Jr. didn’t look all that impressive in beating Rubio last weekend and it wasn’t just that one fight. Chavez Jr. never looks good. He lacks hand speed and power. He’s got size going for him but for a 180 pounder, he’s remarkably weak and slow. HBO analyst Emanuel Steward thinks Chavez Jr. would have big problems against Martinez because of his movement and precise punching. Chavez Jr. wouldn’t be able to crowd Martinez and lean on him in close all night long like he did against the limited Rubio. Martinez would keep moving and lighting Chavez Jr. up. Even in close, Martinez would be lethal because he’s so much faster and powerful than Chavez Jr. As it is, Chavez Jr. got kind of beat up a little by Rubio around the face. It’s scary to think what Martinez would do to him.